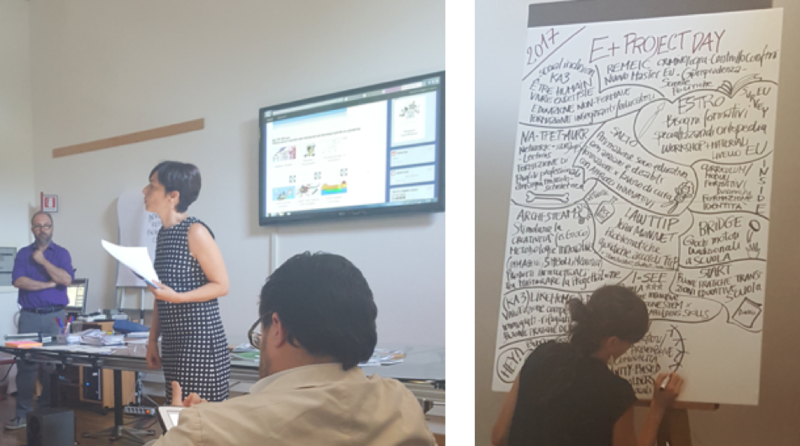 The I SEE project was invited to participate in the E+ Project Day UNIBO on Friday 7th, July 2017. The event took place for the second time in the last two years and was organized by the European Projects Unit of the International Relations Division. All the project coordinators and the local teams were invited to present their E+ projects. The overarching goal of this event is to make the ongoing E+ projects dialogues among them, with the scopes of creating synergies, enhancing the results, involving policy makers and all the stakeholders interest in building international networks. I SEE, as one of the newcomer project coordinated by the University of Bologna, was invited to be part of the event. After a presentation of the organizers, the day was organized in three main moments. The first one was the presentation of newcomers, in which each coordinator was asked to have a brief and sharp presentation of 5 minutes and to explain a concrete object that is highly and symbolically representative of the project. Every four or five presentations the organizers activated a debate for answering questions and finding possible synergies. I SEE presented the notebook of desirable dreams, the object which characterized the Summer School. The second moment was represented of a workshop, called “Gallery Walk”, in which all the participants were divided in groups in order to reasoning about two main issues: 1) E+ suggestions, i.e. collection of hints and feedback for building a position paper addressed to EU Commission in order to contribute to improve the structure and functioning of the E+ Program starting from concrete experiences and good practices developed within the projects in progress; 2) Needs, i.e. a collection of ideas with which the University local governance could support the coordinators in developing, spreading and enhancing the results of their projects. The third moments consisted of a final sharing of the inputs and reasoning of the day.